On Saturday I went to the Sydney On Stage Local event - what a great day! I met up with 16 other Crazy Crafters, saw the new Catalogue and got to play with some of the products! And, as if that weren't enough, I came home with several free stamp sets! This is one of the stamp sets that we all received. It's called Sitting Here and I believe that as time goes by, we'll all be finding more and more ways to use this set. Also included in the set, although I didn't use them this time, there is a cute cat and a little dog as well as a plant and a basket. The animals are designed such that they could easily be sitting on the swing chair. There are three other great sentiments in the set too. On this particular occasion I decided to pair the new with the old. 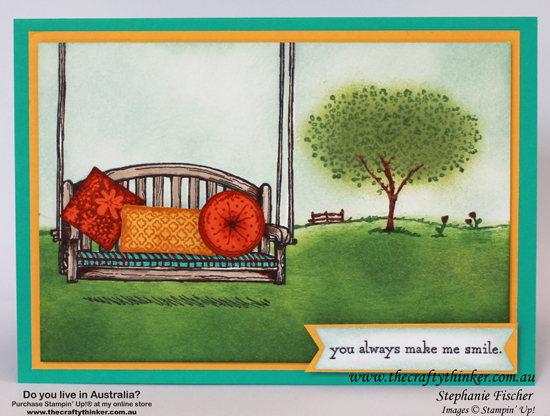 The wonderful and versatile Happy Home stamp set that I have enjoyed using in many different compositions, is retiring. I'm a little sad about some of the retiring products but they're more than compensated for by all the wonderful new things in the catalogue. My wish list is ENORMOUS! I'll be providing some more sneak peeks over the coming weeks. Meanwhile - the retiring products are listed in the online shop now and there are some great bargains to be had. Some of the products are carrying a whopping 50% discount! I encourage you to take a look and snaffle anything you want before they disappear for good. Click this link to shop for retiring products. 'Til next time - I'll leave you with another sneak peek of a product suite that really excites me!.